This is the third in a 3-part series about how to clear your clutter and rediscover the joy of space. We’ve based it on the book, The Gentle Art of Swedish Death Cleaning: How to Free Yourself and Your Family from a Lifetime of Clutter, by Margareta Magnusson. The goal of this series has been to help you get started– or make a plan to get started – helping your aging parents downsize. Hopefully you’ve already implemented some of my suggestions. To review, in Part 1, I gave you some tips and resources for cleaning out your storage unit and stopping junk mail. In Part 2, I talked about downsizing your wardrobe and getting rid of clothes that no longer fit, are out of style or worn out, or that you never wear. Now that we will be moving into Fall, it might be a good time to go through the closet-clearing process again and eliminate those summer clothes that won’t survive another season. Start by discarding multiples, out-of-focus, or simply bad photos. Put names to faces. Capture this information while someone still knows. Make an album for each child with photos from their youth (it’s a great gift!). Scan old slides and copy to a flash drive (another gift idea). 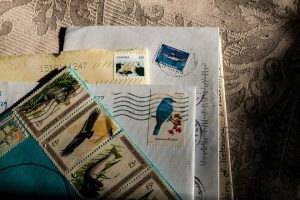 Getting rid of handwritten cards and letters, especially from those who have passed on, may be the hardest task of all. 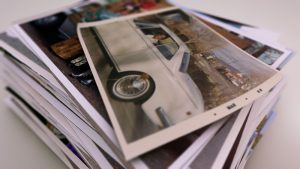 As with photographs, however, sharing this task with other family members is a great way to pass on family history and honor memories of the writer. Consider scanning the most memorable letters and then getting rid of the original. Or matching up a couple of original letters with the person’s photo in one of your albums. Give yourself a limit as to how many letters you will keep (e.g., 3) for each writer. Another idea is to send a packet of letters you’ve accumulated over the years back to the writer. They might be pleased to receive their own little time capsule. As for cards, they can easily be repurposed. Use the tops as postcards or cut them up and use them as gift tags. Also, St. Jude’s Ranch for Children has a recycled card program that accepts card tops to support their work with abused and neglected children.